1060 GBP Contact for Availability. Please phone 0333 2000 750. PM5 Performance Monitor is standard on all Model E Indoor Rowers. One-piece leg design for greater stability and solid feel. Nickel plated chain for low-maintenance and a clean look. Aesthetically, the Model E is the luxury machine of the indoor rower world. Provides an unparalleled full-body workout. Aesthetically, the Model E is the luxury machine of the indoor rower world. Solid and sleek, the Model E will hold its own in a fitness centre, your home gym, or the living area of your midtown loft. Best of all, it does all of this while providing the unparalleled full-body workout of our other indoor rowers. Every Model E includes a PM5 - our most advanced Performance Monitor, so you get accurate, comparable data for every row. 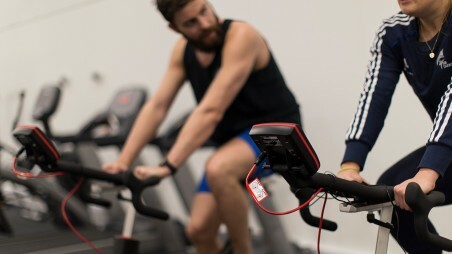 The PM5 monitor uses ANT+ and Bluetooth Smart technology, so you can monitor your heart rate* without extra wires, contains games not offered on the PM3, and has room to grow, so you’ll be able to use features we haven’t even thought of yet! The longer monitor arm keeps it all within easy reach. Our machines are well-known for their durability and construction. Tough and built to last, our machines withstand rigorous use in boat houses, training centres, living rooms, hotels, health clubs and military bases around the world. We make sure our machines are easy to care for so you can focus on using your investment, not maintaining it. 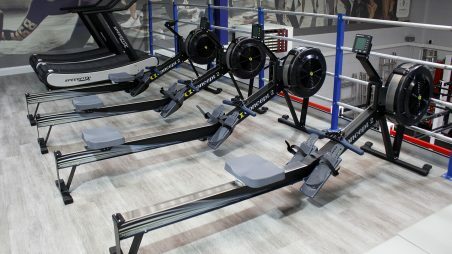 Frame Parts - Five Year Limited Warranty Concept2 Limited will replace or repair, at our discretion, the frame parts listed below that fail due to a defect in materials or workmanship for a period of five years from date of purchase of your Concept2 Model D or E Indoor Rower. This warranty is fully transferable to each subsequent owner of your indoor rower during the term of the warranty should you sell it or give it away. This warranty does not cover: damage to the finish of your machine; damage sustained as a result from neglect, abuse, or failure to follow indoor rower maintenance requirements (see Maintenance); shipping charges and, if applicable, customs clearance fees; or labour for installation of any parts shipped to you under warranty. The five year warranty applies to the following parts: rear leg assembly monorail (excluding stainless steel track) seat frame monorail hangers & bolt tubes footplates metal box arm chain guide brackets monitor mount arm front legs front foot bar (excluding caster wheels) flywheel axle & bearings all screws & bolts flywheel cover (including inner & outer pans, outlet perf) All Parts - Two Year Limited Warranty Concept2 Limited will replace or repair, at our discretion, any part (excluding monitor batteries) that fails for any reason for a period of 2 years from date of purchase of your Concept2 Model D or E Indoor Rower. Whether defective or simply worn out, all parts on your machine (excluding monitor batteries) are covered for the first two years. This warranty is fully transferable to each subsequent owner of your indoor rower during the term of the warranty should you sell it or give it away. This warranty does not cover: damage to the finish of your machine; damage sustained as a result of neglect, abuse, or failure to follow indoor rower maintenance requirements noted below (Maintenance); shipping charges and, if applicable, customs clearance fees; or labour for installation of any parts shipped to you under warranty.labor for installation of any parts shipped to you under warranty. Standard warranty cover and servicing on this product will be carried out in the UK directly by the manufacturer or official servicing partner appointed by the manufacturer. PM4 battery pack recharged when indoor rower is in use. 96 in (244 cm) x 24 in (61 cm).